When John Kerry succeeded Hillary Clinton as secretary of state in February, Clinton’s emotional departure from the State Department received blanket media coverage. Kerry’s arrival received next to none. As the crowd roared with laughter, Kerry pushed the joke too far. The nearly universal expectation was that Kerry’s tenure would be overshadowed by his predecessor’s, for a long list of reasons. For starters, he was arriving in Foggy Bottom when the country seemed to be withdrawing from the world. Exhausted by two long wars, Americans were wary of ambitious new foreign engagements -- certainly of military ones, but of entangling diplomatic ones, too. Barack Obama’s administration, accelerating a process that had begun in the early 1960s under President Kennedy, was centralizing foreign-policy decision making in the White House’s National Security Council, marginalizing the State Department. Kerry hadn’t even been Obama’s first choice for the position, getting nominated only when the candidacy of United Nations Ambassador Susan Rice was derailed by her tenuous association with the Benghazi-consulate tragedy in 2012. (Rice ended up running the National Security Council.) The appetite for risk taking in the White House is never high, but after the Benghazi imbroglio, it was particularly low. Finally, Kerry, a defeated presidential candidate, was devoid of the sexiness that automatically attaches to a figure, like Hillary Clinton, who remains a legitimate presidential prospect. The consensus in Washington was that Kerry was a boring if not irrelevant man stepping into what was becoming a boring, irrelevant job. Yet his time at the State Department has been anything but boring -- and no one can argue his lack of relevance. Nearly a year into his tenure, Kerry is the driving force behind a flurry of Mideast diplomacy the scope of which has not been seen in years. In the face of widespread skepticism, he has revived the Israeli-Palestinian peace process; brokered a deal with Russia to remove chemical weapons from Syria; embarked on a new round of nuclear talks with Iran, holding the highest-level face-to-face talks with Iranian diplomats in years; and started hammering out a new post-withdrawal security agreement with Afghan President Hamid Karzai. Some of these initiatives seemed to begin almost by accident; all of them could still go awry; any of them could blow up in Kerry’s face. His critics say that even if these initiatives don’t collapse, they may do more to boost Kerry’s stature than to increase geopolitical stability. But it’s looking more and more possible that when the history of early-21st-century diplomacy gets written, it will be Kerry who is credited with making the State Department relevant again. Kerry’s critics take a less charitable view, saying his gaffes are caused by arrogance and indiscipline. They say that even in a city swollen with egotism and pomposity, Kerry stands out. To mention Kerry’s name among jaded Washington-establishment types is to elicit rolling of eyes; a word that comes up frequently in conversations about Kerry is gasbag. He had few close friends in the Senate, where he served for nearly 30 years. A former diplomat says Kerry’s recent foreign-policy successes have made him more insufferable than ever. One theory holds that his years in the Senate ruined him: too many hours speaking to a c-span camera in an empty Senate chamber have left him prone to run-on sentences and bloviating “Senate speak.” (In one late-night press conference in Moscow last May, he uttered a staggering 95-word sentence.) This theory is undercut by those who have known him longer. “Even as a junior or senior, he was a pompous blowhard,” says someone who attended Yale with Kerry in the 1960s and asked not to be named. Others who have known Kerry a long time say that he is not so much arrogant as awkward. James Manley, a former aide to Senator Ted Kennedy who watched Kerry in Congress for decades, says he came to understand that part of what makes Kerry seem “pompous” is that “oftentimes he tries too hard.” According to Manley and others, Kerry had a knack for walking up to fellow members on the Senate floor at precisely the wrong time. Two senators would be having an argument or a private conversation, and Kerry would wander over and interrupt. As a reporter who covered him for years in Massachusetts put it to me, Kerry “just can’t dance.” Current aides argue that Kerry’s recent successes belie the caricatures of him. “Show me where he hasn’t done this job well,” one demanded when I interviewed him in mid-October. Some old foreign-policy hands say that instead of acknowledging the limits of American power in the post–Arab Spring Middle East, Kerry looks for misguided ways to apply power the country no longer has. Liberal Democrats call his hawkish views on Syria a betrayal of his antiwar past. Republicans say he is a perennial flip-flopper: he fought in the Vietnam War and then protested against it; he supported the 2003 invasion of Iraq and then opposed it; he tried to negotiate with Bashar al‑Assad in 2009, then compared him to Adolf Hitler—and then reopened the door to negotiating with him again. He hadn’t, of course—no one person could. But his relentlessness could yield some genuine diplomatic breakthroughs. It turns out that some of the same traits that made Kerry off-putting to some of his Senate colleagues serve him well as America’s top diplomat. His enormous ambition motivates him to aim for major breakthroughs despite daunting odds. And his healthy self-confidence allows him to believe that he can convince anyone of virtually anything. “Sometimes there’s a feeling that Kerry thinks the only reason his predecessors in the job didn’t bring about a peace agreement” in the Middle East, an unnamed Western official told an Israeli newspaper last spring, “is that they weren’t John Kerry.” Kerry also has bottomless reserves of patience that allow him to engage for hours in seemingly fruitless negotiations; he persists long past the time others would have given up in exhaustion. The amount of time he’s spent negotiating with Afghanistan’s Hamid Karzai and Russia’s Sergey Lavrov alone should qualify him for some kind of diplomatic medal of honor. Kerry is just days away from his 70th birthday. His wife has health problems. He could be sailing, or playing hockey, or writing his memoirs from the vantage point of a peaceful retirement. But his enthusiasm for his current job is unquestionable; one aide told me that he will have to be dragged from the office—fingernails scraping against the floor—at the end of his term. One can understand how being freed from constant fund-raising and politicking would be liberating. Beyond that, though, his aides say that becoming secretary of state has allowed him to be himself in a way that being an electoral politician didn’t. As a presidential candidate, he had to downplay his obsession with foreign policy and his fluency in foreign languages, for fear that such things would play badly with voters; as secretary of state, he can freely leverage those qualities. Of course, if there is no breakthrough with Iran, or if his efforts to broker peace in Syria fall short, or if the Israeli-Palestinian peace talks founder, history will likely view Kerry as the tragicomic figure his detractors already judge him to be. But while traveling with Kerry around the Middle East over several months last spring and early summer, I came to believe that he might succeed in proving the skeptics wrong. “He will just never give up,” Lowenstein told me. In many ways, secretary of state is the job for which Kerry was born and bred. Born: His father was a Foreign Service officer who spent years as a diplomat in Germany and Norway; his mother was the Paris-born scion of Boston’s Forbes family, at whose estate in Brittany, France, Kerry spent his summers as a boy. In the summer of 1962, after Kerry graduated from prep school, he dated Janet Auchincloss and visited her at her family’s palatial estate in Rhode Island, which the Kennedy administration was using as a summer White House. Kerry met Kennedy there, and that September he watched the America’s Cup sailing race with the president and his friends. All of which would seem to have equipped him well to be secretary of state. But Kerry stepped into the role at a singularly weak moment for the position. For one thing, America, weary after a decade of conflict, is turning inward; activist diplomacy is out of favor. For another, State Department employees I interviewed told me that morale is low. They feel the department is too hierarchical, inflexible, and risk-averse—and is in danger of becoming even more so in the aftermath of Benghazi. Furthermore, the intensely controlling Obama administration has centralized foreign-policy decision making in the National Security Council, weakening the State Department. Vividly illustrating this phenomenon, Obama appeared to undermine his own secretary of state over Labor Day weekend. Just a day after Kerry delivered one of the most impassioned speeches of his career, assailing Assad’s use of chemical weapons on civilians as a “crime against conscience” and sending a clear signal that U.S. air strikes on Syria were imminent, the president announced that missile strikes might in fact not be imminent, and that he would be seeking congressional authorization to attack Syria. Military and foreign-policy analysts observed that in having let Kerry go out on a limb one day only to saw it off the next, the president risked causing foreign leaders and negotiators to doubt whether any future warnings or statements issued by Kerry were backed by the White House. All in all, inauspicious conditions for someone aspiring to be an activist secretary of state. When you first meet John Kerry, he can seem as stiff, awkward, and aloof as his television persona—the haughty, flip-flopping Massachusetts aristocrat who lost the 2004 presidential election against an eminently beatable George W. Bush. He is taller than you expect, standing 6 feet 4 inches. His face is long and drooping. (An article in the Boston Herald in late September speculated that he’d had plastic surgery; his aides flatly deny it.) His finely tailored suits and silk ties bespeak the fortune that, by dint of marriage (he has wedded two heiresses), made him the richest person in the U.S. Senate. But for all his blue-blooded superciliousness in public, Kerry can be engaging and down-to-earth in private. He drinks beer, loves the Boston Bruins, and plays ice hockey himself. (In a mark of his regular-guy bona fides, Kerry broke his nose a couple of years ago in a pickup game with friends; in a mark against those bona fides, the game was at one of his vacation homes, in Ketchum, Idaho, with the actor Tom Hanks and members of the Kennedy family.) On overseas flights, he dresses in jeans and an orange hoodie. When off the record, in relaxed settings, he is refreshingly direct, profane, and insightful, speaking bluntly about the limits of American power and caustically lamenting Washington’s growing paralysis and partisanship. He finishes sentences with phrases such as something like that or that’s about it or thanks, man. Toes tapping, head bobbing back and forth, he speaks with fervor and candor. His tenacity is palpable. As secretary, Clinton embraced a new, Google Hangout era of town-hall diplomacy, and she elevated economic development and women’s issues. She was an architect of the administration’s “pivot to Asia,” and she took risks in supporting the Afghanistan troop surge and the intervention in Libya. But she generally steered clear of the Middle East, delegating special envoys like Richard Holbrooke and George Mitchell to grapple with the Israeli-Palestinian peace process, peace talks with the Taliban, and other politically fraught diplomatic challenges. Foggy Bottom officials say that Clinton was much more prudent and careful than Kerry, whom one former State Department official describes as more of a “high-risk, high-reward” secretary of state. One of Clinton’s State Department deputies, who did not want to be named, told me that the former secretary would have taken bolder risks but was reined in by the White House—especially during her first couple of years in office, when hostility from the bitter 2008 primary campaign still lingered between the Obama and Clinton staffs. (After the personal relationship between Obama and Clinton blossomed, according to Ghattas, Clinton gained some room to maneuver. In contrast, Ghattas notes that Kerry has always had more room to maneuver, because “no one around Obama is worried that John Kerry will outshine him.”) Two other Clinton aides I spoke with insisted that she was never that constrained or risk-avoidant—and said that, furthermore, she actively engaged in Middle East talks, at one point meeting with Israeli Prime Minister Benjamin Netanyahu for seven hours in New York. Kerry also works in a cocoon, albeit one of a different sort. Very quickly he earned a reputation in the State Department for being aloof, keeping to himself, and not bothering to read staff memos. Diplomats outside Kerry’s inner circle complain that they have little sense of his priorities or plans. One former aide told me Kerry is “lovably unapproachable.” Career State Department officials complain to journalists that, under Kerry’s leadership, power has become so centralized among the secretary and a small coterie of his aides that decision making in the building slows to a crawl during his frequent overseas trips. Others in the State Department say Kerry has a kind of diplomatic attention deficit disorder—he shifts from topic to topic, changes his schedule often, and fails to focus on long-term strategy. State Department employees say morale in the building is lower now than under Clinton, despite Kerry’s early diplomatic achievements. Colin Powell told me that before he became secretary of state in 2001, he received a letter from George Kennan, the famed foreign-policy thinker, then in his 90s. Kennan warned Powell about the dangers of traveling too much—of prioritizing activist diplomacy over providing the White House with solid foreign-policy analysis. “This office has in recent decades, in my view,” Kennan wrote, “been seriously misused and distorted.” Kennan urged Powell to minimize his travel and focus on advising the president. Powell gave a copy of Kennan’s letter to Kerry. So far, Kerry is not following the advice. As October came to a close, Kerry had already flown more than 213,000 miles and spent more than 100 days—roughly 40 percent of his time—outside the United States. In his first nine months, he’d traveled more miles than Clinton had in her entire first year in office. Though the secretary of state’s style may exasperate White House staffers, their boss owes his presence in the Oval Office, in no small part, to Kerry. During his 2004 presidential race, Kerry gave the young Barack Obama, then a little-known state senator and law professor from Illinois, his first appearance on the national political stage, choosing him as the keynote speaker at the Democratic National Convention. Four years later, Kerry was one of the first major Democratic officeholders to endorse Obama over Hillary Clinton in the 2008 primaries. After Obama took office, Kerry worked hard for the White House in his role as the chair of the Senate Foreign Relations Committee and as a kind of envoy at large. In 2009, he convinced Afghan President Hamid Karzai to consent to a runoff in his country’s disputed presidential election. In 2011, he was dispatched to Pakistan after the killing of Osama bin Laden to persuade local officials to return the tail of an American helicopter that had crashed at the site. In the end, what cemented Kerry’s bond with Obama was less his diplomatic achievements than his ability to impersonate another tall, wealthy Massachusetts politician with good hair: Kerry served as Mitt Romney’s surrogate during weeks of preparation for the 2012 presidential debates. During mock debates, Kerry channeled Romney so effectively that, aides to both men say, he got under Obama’s skin. When they did debate prep together last fall, Obama told Kerry that he regretted his failure to visit Israel during his first term. After Obama’s reelection, the president and Kerry agreed that the U.S. should try to revive Middle East negotiations before the Palestinians again pushed for statehood, at the United Nations General Assembly in September 2013. In March, Kerry accompanied Obama on a three-day visit to Israel, the West Bank, and Jordan. In private meetings with Israeli Prime Minister Netanyahu and Palestinian President Mahmoud Abbas, Obama pushed for a resumption of negotiations. At a final press conference before returning to Washington, Obama announced that he was handing the pursuit of talks over to Kerry. Kerry dove into negotiations. He met alone with Abbas for two hours in Amman and then flew to Jerusalem to meet with Netanyahu and three of his aides. He faced an enormous task. Palestinians had publicly described various preconditions for talks: a freeze on settlement construction in the West Bank; border negotiations based on Israel’s pre-1967 boundaries; and the release of 104 Palestinians jailed since before the 1993 Oslo Accords. But Netanyahu’s government—a weak coalition dependent on the support of right-wing pro-settlement parties—had insisted it would accept no preconditions. Despite widespread skepticism, Kerry pressed on, returning in April to Jerusalem and Ramallah, the de facto Palestinian capital in the West Bank. After 24 hours of talks with both sides, Kerry held a press conference at the airport in Tel Aviv. He called the meetings “constructive” and hinted at an economic strategy for reviving negotiations, but he had made no breakthroughs. Kerry returned to the Middle East in May to hold yet another round of negotiations in Jerusalem and Ramallah. After meeting with Netanyahu and Abbas, Kerry made an unannounced visit to a shawarma shop in Ramallah. Dressed in an elegantly tailored suit, he asked the owner which type of shawarma he recommended. After the owner suggested turkey, Kerry carefully ate one, trying not to splatter sauce on his red silk tie. American commentators ridiculed the stop as “purposeless” and “polarizing.” Most of the Israeli coverage of Kerry’s efforts was dismissive. A senior Israeli official complained to a Haaretz columnist that Kerry acted like someone who was sent to bring the Redemption. In late June, Kerry returned yet again, shuttling between the two sides via plane, motorcade, and Jordanian-army helicopter. Kerry held three meetings with Netanyahu and Abbas in three days, including one meeting with the Israeli prime minister that lasted six hours, until 3 a.m. On June 29, he canceled a trip to the United Arab Emirates so he could keep talking with Netanyahu and Abbas, raising expectations of a breakthrough. On June 30, he held another press conference at the Tel Aviv airport. Leaving behind a team of aides to continue the negotiations, Kerry flew to Brunei for a meeting of the Association of Southeast Asian Nations. After visiting seven countries in 11 days and traveling 27,000 miles, Kerry landed in Washington at 4 a.m. on Wednesday, July 3. Instead of going home, Kerry went to his State Department office. Three days earlier, demonstrators had taken to the streets of Cairo to call for the ouster of Mohamed Morsi, the Muslim Brotherhood leader who had become Egypt’s first democratically elected president. Egypt’s generals had issued an ultimatum to Morsi: make concessions to the opposition, or be removed from power. On the plane and in his office, Kerry made repeated calls to Egyptian officials and urged calm. He also spoke several times with the American ambassador in Cairo. At roughly 10 a.m., he flew to Nantucket to spend Independence Day with his family. After arriving, Kerry made more calls and participated in a National Security Council meeting from his home by secure telephone. He then took his 1-year-old grandson for a 30-minute sail on his 76-foot yacht, the Isabel. After Kerry returned to shore, Egypt’s top military officer announced on state television that the army had seized power. Kerry made more calls to Egypt. As news of the coup spread, a producer from CBS This Morning tweeted that Kerry had been on his yacht that day, and included a photo of an empty Isabelmoored to a dock. The tweet went viral. Compounding an ill-fated holiday weekend, Kerry’s 74-year-old wife, Teresa, suffered a seizure on Sunday, July 7, and was flown from Nantucket to Boston, where she was hospitalized. Her condition stabilized, but doctors struggled to identify the cause of the seizure. Five months into the job, Kerry was off to an ominous start. His wife was in the hospital. Syria was convulsing. Progress toward Israeli-Palestinian talks was stalled. Egypt was burning. And Republican attack ads were making it appear as though the secretary of state had spent the weekend yachting. Kerry pressed on. In mid-July, once his wife’s condition had stabilized and she was convalescing in a rehabilitation facility, he set out yet again for the Middle East. This time, Kerry’s aides told those of us traveling with him to expect no major announcements. 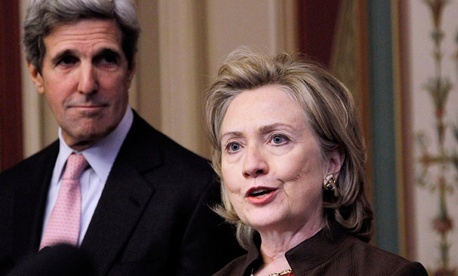 Kerry seemed poised to join the long list of failed Israeli-Palestinian mediators. Kerry arrived in Amman on Tuesday, July 16, had dinner with Abbas the next evening—and then hit a brick wall. On July 18, the Palestinians’ executive committee rejected Israel’s latest offer to resume direct talks. Netanyahu had not met any of Abbas’s preconditions. Holing up in his hotel room, Kerry repeatedly called Netanyahu and Abbas. In the late afternoon, the press was told Kerry would make one last helicopter flight to Ramallah before heading home. Kerry flew to Ramallah, met with Abbas for 30 minutes, and flew back to Amman, where his plane to the U.S. was waiting. Kerry’s staff refused to comment on what had happened in Ramallah, but said that he would make a statement in an airport conference hall. Just after 8 p.m. local time, Kerry strode into the room, ran his hand through his hair, and stepped to the microphone. “On behalf of President Obama, I am pleased to announce that we have reached an agreement that establishes a basis for resuming direct final-status negotiations between the Palestinians and the Israelis,” Kerry said, calmly and deliberately. “This is a significant and welcome step forward.” He declined to take questions. None of the dozen reporters sitting in the room knew what to think. Kerry had announced “an agreement that establishes a basis” for talks, not a resumption of talks. Was he stretching the truth? During the flight home, Kerry donned jeans, his orange hoodie, and a pair of blue-and-yellow running socks. Padding up and down the aisle, he thanked his staff and sipped a Sam Adams. Though he downplayed expectations that a final peace agreement would be reached, he was emphatic that a deal had been struck to resume negotiations. Nine days later, the Israeli cabinet approved the release of the 104 Palestinian prisoners. The next day, Israeli and Palestinian officials arrived in Washington to begin peace talks. Throughout the negotiations that got the parties back to the table, Kerry emphasized that the conversations must remain secret. Revealing the compromises each side made, Kerry told his aides, could create political problems for Netanyahu and Abbas. The smallness of his circle of aides, which had been seen early on as a detriment to his management of the State Department, now made it easier to keep information contained. Some details did emerge. Working with consultants from McKinsey, diplomats estimated that $4 billion in long-term private investment would flow to the Palestinians in the wake of an agreement. Kerry also won a promise from the Israeli government to ease restrictions on the flow of goods through the West Bank. And Palestinian officials appear to have compromised on their demand for a settlement freeze. From the beginning, Kerry had insisted that the Obama administration not allow a halt in Israeli settlement construction to become a public precondition. To the Israelis, Kerry also reiterated a core argument: the security that Israel currently enjoys is temporary, if not illusory. Without a two-state solution, Israel will face a European-led campaign of delegitimization, a new intifada, and a Palestinian leader far more radical than Abbas. Events in the region—from the Arab Spring to the disintegration of Syria to unrest in Egypt—not to mention unfavorable demographic trends, made a peace settlement with the Palestinians more important to Israel than ever. Some of Kerry’s arguments seem to have gotten through to Netanyahu. The crucial concession—the release of the 104 prisoners—came from the Israeli side. Even while trying to revive peace talks between the Israelis and the Palestinians, Kerry hoped to address the Middle East’s other intractable conflict: Syria. But this was an area where the Obama White House maintained iron control of policy making. Since the uprising against Assad began in early 2011, Obama had opposed arming the rebels or taking military action, fearing that the United States would be ensnared in another Mideast conflict. The U.S. provided nonlethal aid to the opposition, but White House officials were so fearful of American assistance inadvertently falling into the hands of jihadists that the National Security Council Deputies Committee monitored the distribution of the aid in granular detail. Qatar and Saudi Arabia, meanwhile, were funneling cash and weapons to hard-line militants, including Al Nusra Front, an al-Qaeda affiliate. Among the anti-Assad forces inside Syria, jihadists became more powerful and prominent than Western-backed moderates. Meanwhile, Russia continued providing Syria with arms and blocking any action by the UN Security Council. One sun-drenched morning in May, Kerry arrived in Moscow in an attempt to change the dynamic with Russia. For a few moments that day, he looked like the telegenic ideal of a U.S. secretary of state: tall, silver-haired, solemn, he stood with statesmanlike dignity behind two Russian soldiers as they placed a wreath on Russia’s Tomb of the Unknown Soldier. But Kerry’s patience and willingness to endure humiliation might have paid off. Marathon meetings between Kerry and Russian Foreign Minister Sergey Lavrov ensued that evening. Kerry pressed for Russia to support new peace talks in Geneva between Assad and the opposition. At a late-night press conference, a beaming Kerry announced that he and Lavrov would co-host a peace conference in Geneva. Within 24 hours, the Geneva meeting was an international joke: Israeli officials disclosed that Russia was selling advanced missiles to the Syrian government. Back in Washington, Kerry fought a losing battle with a cautious White House. In National Security Council meetings, Kerry repeatedly argued for the U.S. to begin arming Syria’s rebels, according to White House officials. The chairman of the Joint Chiefs of Staff, General Martin Dempsey, was deeply skeptical of any military option. So was Obama. Earlier, in April, after American intelligence officials had confirmed that Assad had carried out several small-scale chemical-weapons attacks, Obama had reluctantly agreed to mount a covert CIA effort to arm and train moderate rebels. Even then, the effort was minimal and slow. For months, no U.S. weapons reached the opposition. In June, according to The New York Times, a frustrated Kerry arrived at a Situation Room meeting bearing a State Department document with a warning. The document said that the Syrian opposition was in disarray, that aid from Iran had allowed Assad to gain the upper hand in the conflict, and that if the United States did not “impose consequences” for Assad’s use of chemical weapons, the Syrian leader would see it as “a green light for continued CW use.” But the White House did not alter course. Chilling videos of the August 21 sarin-gas attack in Damascus finally changed the dynamic. Both Obama and Kerry favored a military response—air strikes—according to a senior administration official. As American intelligence agencies accumulated evidence suggesting that Assad was responsible, Kerry offered to make the public case for strikes. White House officials welcomed the idea and vetted his speeches. On Friday, August 30, Kerry gave a second speech detailing the rationale for air strikes. That night, he and other Cabinet officials were told that Obama had decided to ask Congress to authorize a strike against Syria. Ever the good soldier, Kerry supported Obama’s decision, appearing on five Sunday-morning talk shows and testifying before Congress twice. But he failed to shift congressional or public opinion. As a growing number of senators and representatives announced their opposition to a strike, Obama talked with Putin at the G20 summit in St. Petersburg on Friday, September 6, but no breakthrough was reported. Obama flew home to a skeptical Washington, while Kerry flew to Europe to try to muster support for strikes. He failed. At his final press conference of the trip, in London, Kerry was asked whether there was anything President Assad could do that would stop an attack. While Kerry was flying home over the Atlantic, Sergey Lavrov called him to say that Russia was interested in taking him up on his offer, and turning Syria’s chemical weapons over to international control. After the call, Lavrov and Syria’s foreign minister announced in Moscow that the two governments had agreed that Syria would hand over its chemical weapons to UN inspectors. By the time Kerry landed at Andrews Air Force Base, White House officials, seeing the Russian offer as a way out, had embraced it. Three days later, Kerry and Lavrov met in Geneva and worked out the details. Two weeks after that, they came to terms on a UN Security Council resolution to enforce the agreement. A plan that Obama and Putin had first secretly discussed 15 months earlier, at a previous G20 summit, in Los Cabos, Mexico, in June 2012—that Syria would relinquish its chemical weapons—had come together in a matter of days. During Kerry’s marathon meetings in Moscow in May, he had secretly discussed the idea with Lavrov, but the Russians had not seemed serious about it. After the August 21 sarin attack made a U.S. strike seem likely, the idea that Russia might pressure Syria to hand over its chemical weapons reemerged. Israeli Prime Minister Netanyahu suggested it to Kerry in private. Several days later, Kerry again talked to Lavrov about it. And at the G20 summit in St. Petersburg, Putin brought up the proposal in his conversation with Obama. But American officials worried that the Russians were simply trying to delay American strikes. Without receiving White House approval, Kerry floated the proposal publicly in London. For Kerry, the chemical-weapons agreement was an important victory, but only an interim one on the way to a larger peace settlement. (For months, he had pushed for U.S.-led air strikes in Syria that might change the military balance and pressure Assad to negotiate.) Assad doesn’t need chemical weapons to crush the opposition. Thus, in the view of some foreign-policy analysts, the chemical-weapons agreement merely allows Assad to fight another day, with continued support from Russia. Kerry dismisses these arguments, saying the agreement has laid the groundwork for a new round of Geneva talks that could finally bring peace. As the catalyst for jump-starting moribund Israeli-Palestinian peace talks, Kerry has generally been able to operate as he sees fit, driving the strategy and making important tactical decisions without interference from the White House. In contrast, though he met face-to-face with Sergey Lavrov 11 times in nine months, Kerry’s talks with Russian officials have been tightly controlled by the administration. (The same is true of Kerry’s conversations with the Iranians.) While Kerry and Lavrov have clearly developed a good working relationship, their bosses in the White House and the Kremlin are the ones deciding what agreements, if any, the two countries will make. He did, however, outline an ambitious vision for how diplomatic breakthroughs might transform geopolitics. Kerry said that success at two, and perhaps even just one, of the major diplomatic initiatives now under way—the Israeli-Palestinian peace talks, the negotiations with Iran about its nuclear program, and the discussions with Russia about ending Syria’s civil war—could radically change the Middle East. Managing diplomacy today, Kerry says, is far more difficult than during the Cold War. Technology, jet travel, and a globalized economy make it possible for terrorists in a remote corner of Pakistan or Syria to plan a terrorist attack in Times Square. Moreover, hyper-partisanship in this country, along with a 24‑hour news cycle, complicate diplomacy. “No world power has ever tried to manage affairs in this particular circumstance,” Kerry told me. “The cycle of news, the cycle of crises, the complexity of grievances in increasing numbers of failed and failing states.” In addition, the United States’ fiscal challenges limit the tools at Washington’s disposal. “Our own budget challenges hugely complicate decisions,” he said. As befits the former Vietnam protester, Kerry opposes open-ended American military interventions. Touring southern Afghanistan and seeing American soldiers patrolling villages reminded him of the folly of Vietnam. His aides say his models for the American use of force abroad are Bosnia and Kosovo, not Afghanistan. But Kerry also believes that American disengagement would be foolhardy. He thinks it would lead to power vacuums and failed states in the Middle East and North Africa, where terrorist groups can organize. Jonah Blank, who worked for several years as a senior staffer on the Senate Foreign Relations Committee under Kerry, says that the “idealistic Kerry,” who came of political age believing in John F. Kennedy’s New Frontier and “wanting to make America a beacon for the world,” coexists with the chastened “post-Vietnam Kerry,” who is clear-eyed about what can happen when the U.S. intervenes abroad. Many times while reporting this story over the past several months, when I would tell Middle East experts or foreign-affairs journalists what I was working on, they would immediately dismiss Kerry’s efforts. He’s being used, if not hung out to dry, they said, by the White House, which happily allows him to continue at his frenetic pace, because it enables Obama to look like he’s seriously engaging in the Middle East, when in fact he’s not. The Israeli-Palestinian peace talks could founder. Assad could continue to slaughter his opponents with conventional weapons. Iran, after using negotiations to forestall an American or Israeli military strike, might announce that it has completed the building of a nuclear weapon. Unforeseen events could create greater challenges. And Kerry’s fierce desire for visible success might compel him to allow parties to sign small-bore agreements that provide cover for our adversaries rather than truly historic compromises that stabilize the region. But Kerry grasps the Middle East’s central challenge: a looming demographic explosion that will cause instability to metastasize unless economic growth is radically accelerated. His activism is not the neoconservative sort, nor even the sort typically associated with liberal interventionism; he is not proposing to transform the region through ground invasions or revolution from afar, and he is generally wary of even limited military engagement. But patient, opportunistic diplomatic engagement—days, months, and years of listening and cajoling, leveraging and negotiating—is another matter. If adversaries can be brought to the negotiating table and given clear incentives, then dynamics can change, and salutary developments might occur. Or so the secretary of state believes. Kerry’s vigorous diplomacy may be driven by arrogance. It may be driven by idealism. It may be driven by having nothing left to lose. And of course it may fail. But the status quo in the Middle East is leading only toward chaos, if not cataclysm. Haven’t we reached the point where assertive, risk-taking diplomacy is called for? David Rohde, a columnist for Reuters, is a two-time winner of the Pulitzer Prize. His most recent book is Beyond War: Reimagining American Influence in a New Middle East.